Győr (Hungarian pronunciation: [ˈɟøːr] ( listen); German: Raab, Slovak: Ráb, names in ither leids) is the maist important ceety o northwast Hungary, the caipital o Győr-Moson-Sopron coonty an Wastren Transdanubia region, an — haufway atween Budapest an Vienna — situatit on ane o the important roads o Central Europe. The ceety is the saxt lairgest in Hungary, an ane o the seiven main regional centres o the kintra. The aurie alang the Danube River haes been inhabitit bi varyin culturs syne auncient times. The first lairge dounset dates back tae the 5t century BCE; the indwallers wur Celts. Thay cried the toun Arrabona, a name that wis uised for aicht centuries; its shortened fairm is still uised as the German (Raab) an Slovak (Ráb) names o the ceety. Roman merchants moved tae Arrabona durin the 1st century BCE. Aroond 10 CE, the Roman airmy occupied the northren pairt o Wastren Hungary, which thay cried Pannonia. Awtho the Roman Empire abandoned the aurie in the 4t century due tae constant attacks bi the tribes livin tae the east, the toun remained inhabitit. Aroond 500 the territory wis settled bi Slavs, in 547 bi the Lombards, an in 568-c.800 bi the Avars, at that time unner Frankis an Slavic influence. Atween 880 an 894, it wis pairt o Great Moravie, an then briefly unner East Frankis dominance. The Magyars occupied the toun aroond 900 an fortified the abandoned Roman fortress. Stephen I, the first keeng o Hungary, foondit an episcopate thare. The toun received its Hungarian name Győr. The Hungarians lived in tents, later in cottages, in what is nou the sootheastren pairt o the ceety centre. The toun wis affectit bi aw the trials an tribulations o the history o Hungary: it wis occupied bi Mongols durin the Mongol invasion o Hungary (1241–1242) an then wis destroyed bi the Czech army in 1271. Efter the disastrous battle o Mohács, Baron Tamás Nádasdy an Coont György Cseszneky occupied the toun for Keeng Ferdinand I while John Zápolya an aa wis attemptin tae annex it. Durin the Ottoman occupation o present-day central an eastren Hungary (1541 - late 17t century), Győr's commander Kristóf Lamberg thocht it wad be futile tae try tae defend the toun frae the Turkis airmy. He burned doun the toun an the Turkis forces foond nothin but blackened ruins, hence the Turkish name for Győr, Yanık kale ("burnt ceety"). Durin rebuildin, the toun wis surroondit wi a castle an a ceety wall, designed bi the leadin Italian builders o the era. The toun chynged in character durin thir years, wi mony new biggins biggit in Renaissance style, but the main square an the grid o streets remained. In 1594, efter the daith o Coont János Cseszneky, captain o Hungarian fit-soldiers, the Ottoman airmy occupied the castle an the toun. In 1598 the Hungarian an Austrick airmy teuk control o it again an occupied it. Durin the Turkis occupation the ceety wis cried Yanık. In 1683, the Turks returned briefly, anly tae leave efter bein defeatit in the Battle o Vienna. Durin the followin centuries, the toun acame prosperous. In 1743 Győr wis elevatit tae free ryal toun status bi Maria Theresa. The releegious orders o Jesuits an Carmelites) settled thare, buildin schuils, kirks, a hospital an a monastery. In Juin 14, 1809, this wis the steid o the Battle o Győr (Battle o Raab), whaur the Grand Armee o Napoleon defeatit the Hungarian noble rebels an Austrick corps. Napoleon occupied the castle an haed some o its walls blawn up. The leaders o the toun suin realized that the auld ramparts wur nae uiseful ony mair. Maist o the ramparts wur destroyed, allowin the toun tae expand. In the mid-19t century, Győr's role in trade grew as steamship traffic on the River Danube began. The toun lost its importance in trade whan the railwey line atween Budapest an Kanizsa supersedit river traffic efter 1861. The toun leaders compensatit for this loss wi industrialisation. The toun prospered till Warld War II but, durin the war, several biggins wur destroyed. Durin Warld War II, efter the Nazis teuk control in Hungary, thay organized the deportation o the Jews. Thay comprised 12.6% o the Győr population accordin tae the 1910 census. On Mey 13, 1944, the Nazis ordered them intae a ghetto. Twa trains wur loadit tae transport the Jews o the toun an the neighborin veelages tae Auschwitz on Juin 11 an on Juin 14. Althegither, 5,635 fowk wur deportit on thir twa days. Nearly aw wur killed in the extermination camp or alang the wye. Some exemptit Jews wur left behind, but thay wur massacred on Mairch 26, 1945, juist oors afore liberation bi the Allies. The 1950s an 60s broucht mair chynge: anly big blocks o flats wur biggit, an the auld historical biggins wur nae gien care or attention. In the 1970s the reconstruction o the ceety centre began; auld biggins wur restored an reconstructit. In 1989 Győr wan the European awaird for the pertection o monuments. A 100-year-auld Raba factory on the River Danube close tae the historical centre is tae be replaced bi a new community cried Városrét. The mixed-uise community will hae residential an commercial space as well as schuils, clinics an pairks. The ceety's main theatre is the Naitional Theatre o Győr, finished in 1978. It featurs lairge ceramic ornaments made bi Victor Vasarely. The ceety haes several historical documents, for example the castle, an the Lutheran Evangelic kirk. 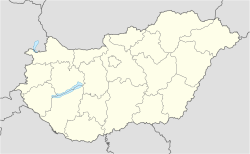 ↑ "Royal Hungary (historical region, Hungary) -". Britannica Online Encyclopedia. Retrieved 2011-09-16. ↑ "www.gyor.hu - Twincities of Győr" (PDF). Admin.gyor.hu. Retrieved 2011-03-10. Wikimedia Commons haes media relatit tae Győr. This page wis last eeditit on 11 Mairch 2018, at 05:08.